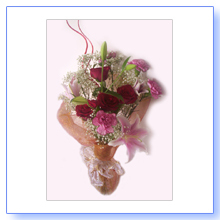 On this page you can see various examples of bouquets that you can order for any occasion. 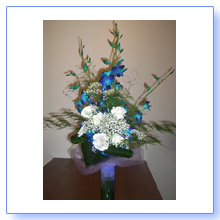 If you like one of them, just select a size (small, medium or large) and specify if you need a vase - most of the bouquets on the pictures above are "medium" size. 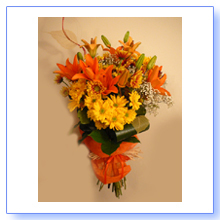 You can also choose some more from Main or Gift Ideas pages. * When any of the flowers and supplies pictured are not available due to local market conditions, an appropriate substitution will be made. Quality, value and complete satisfaction are always guaranteed. Not exactly sure yet? Let us help you! 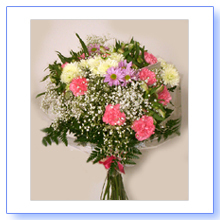 Just select the size and we will prepare you beautiful bouquet from the freshest "flowers of the day"
Ready arranged designs of seasonal flowers, ideal to simply "pop" in a vase just as they are! Gift wrapped, no container. 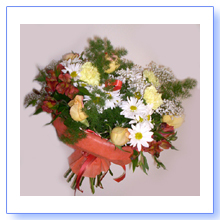 Beautiful bouquets delivered in water in a�designer vase. 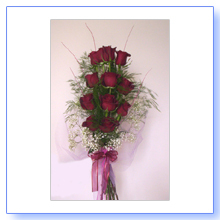 There is no better way to say, "I love you" than with the traditional flower of love, roses. From startling pinks and yellows to time-honoured whites and creams, these enchanting stems can be given as a presentation bouquet without a container or delightfully arranged in clear glass vase.